A group of model engineers will continue their search for a new home after a planning application was turned down. The Peterborough Society of Model Engineers is appealing for help to find a permanent base nearly four years after having to leave its home at Thorpe Hall. Hopes were raised that the group could move on to the former camp site known as the Hostel Site in London Road, Yaxley, but despite two years of preparing an application it was rejected by Peterborough City Council’s Planning and Environmental Protection Committee earlier this month. Marion Parker, the society’s treasurer, said: “We were quite upset but we have to go onwards and upwards. Several of the councillors on the committee said it was a great idea but just the wrong site. Planning officers recommended the application be rejected because the site is identified as public open space within the Great Haddon development and the access point would increase traffic too much. The society had to leave Thorpe Hall in October 2011 after 28 years there due to redevelopment of the site. 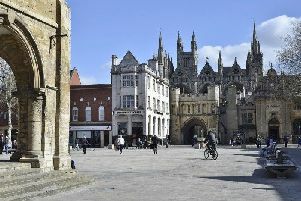 The society can be contacted on www.peterboroughsme.co.uk or on 01733 561016.